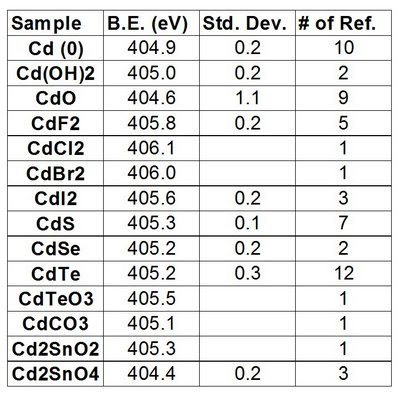 Data taken in this laboratory  shows the Cd 3d5/2 peak for cadmium metal to be at 405.0 eV with FWHM's of 0.60 eV (10 eV Pass Energy) and 0.66 eV (20 eV Pass Energy). (Note: Peak appears to have a slightly asymmetric shape.) The Cd 3d5/2 - Cd M4N45N45 modifed Auger parameter for the metal is 788.95 eV. The Cd 3d5/2 peak for the native oxide (polished Cd metal surface, air exposed) was found at 405.5 eV with a FWHM of 1.5 eV (10 eV Pass Energy). A summary of literature values is shown in Table 1 . Obviously the CdO value, with a large standard deviation of 1.06 eV, needs to be addressed. Most of the values shown here statistically overlap to some degree. This may suggest that the modified Auger parameter may be of use here. It would also be advantageous if quality standards pertinant to specific Cd containing samples could be analyzed. Click here for a CasaXPS ready file of sputter cleaned Cd metal including the Cd 3d and Cd MNN peaks. Table 1. Cd 3d5/2 literature values. Figure 1. Cd 3d5/2 spectrum of cadmium metal. 1) M.C. Biesinger, unpublished results (2009).